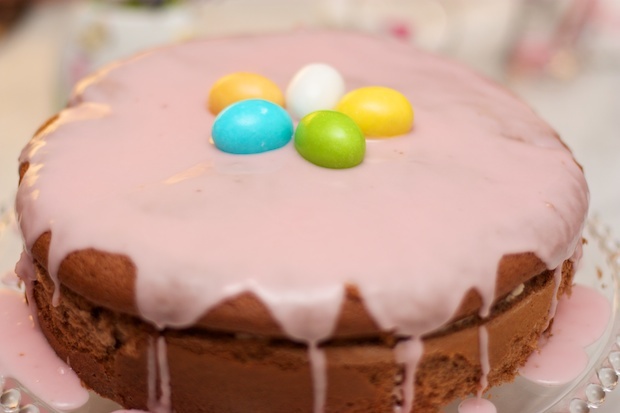 This cake is decorated with symbols of Easter, it is a reworking of Black Forest Cherry Cake that I enjoyed adapting, transforming the sponge cake into a square containing a soft filling with cherries in syrup. This cake is very popular in Austria and Germany, where a competition is held every year to name the queen of this pie. It is best to cook the sponge cake a day in advance. Mix the flour with the cocoa and sift them. Break the eggs into two bowls, separating the egg whites and yolks. Mix the mounted yolks with the cream and sugar and vanilla. Beat the egg whites until they are firm with a pinch of salt. When you are ready, mix them with the flour and cocoa together with the egg yolks, taking care to mix with a gesture from the bottom upwards using a whisk or a silicone spatula. Grease and flour a cake tins with detachable edges (about 24 cm). Pour in the mixture and bake for 35 minutes. After this time turn off the oven and keep the cake inside for 10 minutes. Remove from oven and let the sponge cake cool in the mold. Gently remove mold and place on serving platter. With a serrated knife cut the top of the cake creating the lid of the box. Remove the center of the cake leaving a small edge and a thin base. (The paste was created with a bit of breakfast jam). Drain the cherries from their juice while retaining a full glass. Stir the cherries and jam. Pour half the liquid into another glass by adding two tablespoons of kirsch (optional). With this liquid, wet the bottom of the cake with a spoon. Arrange the cherries on top with the jam and press them lightly. Whip the cream, add a tablespoon of powdered sugar and pour it over cherries. Then put the top pressing it down with your hands. In a bowl mix the icing and add the remaining tablespoon cherry juice, stirring constantly. When you form a thick cream, pour the icing on the cake. Decorate with 5 eggs and refrigerate. Posted in Dessert, no category. RSS 2.0 feed.